A stable train of compressed Stokes pulses (to ~10 nsec) is obtained in a stimulated Brillouin fiber ring laser (of length L = 83 m) by periodically interrupting the argon-ion cw pump beam with an intraring cavity acousto-optic modulator. Interruption of the pump action, at each round-trip time tr ≃ Ln/c, permits damping of the excited sound waves that accumulate at the entry of the fiber owing to the inertial response of the material, well described by the coherent three-wave stimulated Brillouin scattering model (C3W-SBS equations). 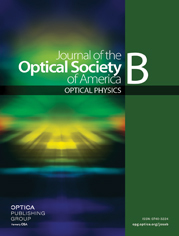 Amplification and compression of the backscattered Stokes pulse are limited by nonlinear optical Kerr effect, which is incorporated into the C3W-SBS equations.